Azania front Lutheran cathedral, view from intersection of Maktaba st. and Sokoine dr.
Azania front Lutheran cathedral, view from Kivukoni front rd. 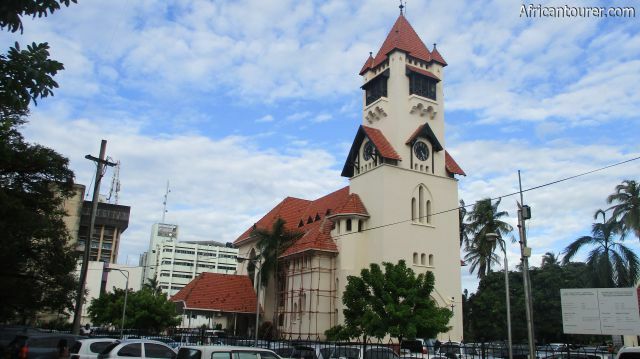 The Azania front lutheran cathedral is a christian church belonging to the Evangelical Lutheran church and is located in the CBD of Dar es Salaam - Tanzania. 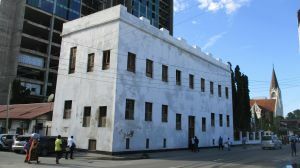 It is among one of the oldest buildings in the city, as well as an iconic landmark and is still used today as a church. 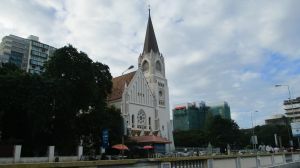 The church was constructed by German missionaries between the years 1899 and 1902 in a gothic Bavarian style, with one tower and a brick red tiled roof. 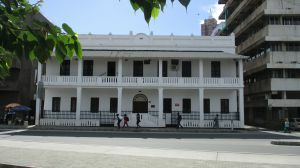 It was among the first owned by the church in east Africa and the first mass was held in 1902 . What to do there?Nothing much as it is still used as a church today, making access restricted unless you are on church business. 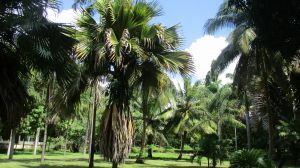 In other words you can only see the church from outside the compound or go in for church related reasons; However, the scenery around the church is also amazing, particularly the Magogoni creek, so feel free to take in the rest of the sights. 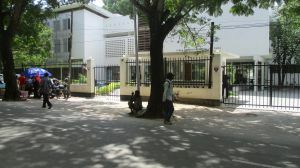 The Azania front Lutheran cathedral is sandwiched between Kivukoni front rd. 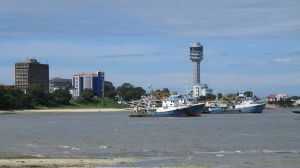 (south), Sokoine dr. (north) and Maktaba st. (west), right in front of Dar es Salaam's Magogoni creek - Tanzania. This is one of the oldest parts of the city and with a short walk through the neighbouring areas, you should see more of these buildings, usually no more than 3 stories high and labelled with the year that it was completed. For more information on its location, please see the map below (click to start). How to get there?The city's newest transport - BRT has a bus stop that is barely fifty metres from the church, so if you can get one of these buses that are headed to Kivukoni, then just ask for the stop that is nearest to the church (usually Posta). Other methods would depend on where you are and for the sake of time would not be listed here, just use the map below. Are you associated with Azania Front Lutheran Cathedral ? Contact us to improve this page or create another page for your business.